Since our early years, East Coast Media has used the term ‘One Design, Many Applications’ to describe our services. We pride ourselves on being a full-service source for our clients to help market themselves. Our diverse staff and range of services allows our designers to take your logo and design elements from one piece and use it across multiple digital mediums – including print, web, mailing and promotional items, and because our designers work so closely together, this can be done more quickly and cost-effectively than using a marketing agency or multiple vendors for your marketing needs. 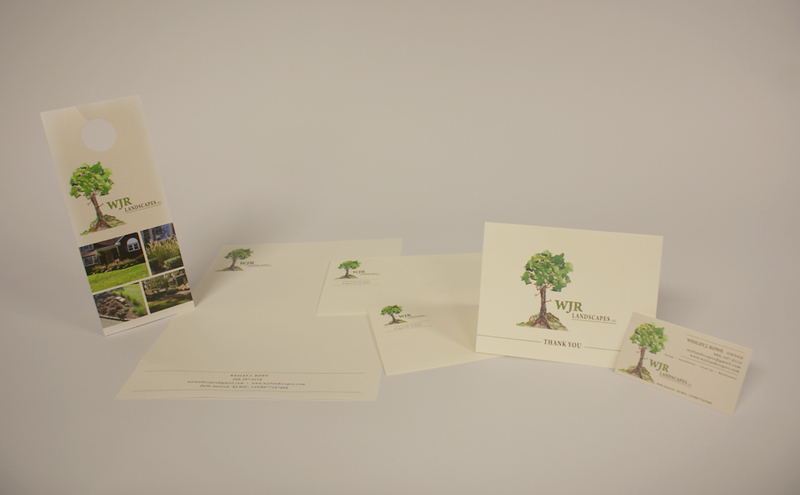 This project for WJR Landscaping included door tags, letterhead, two different sized envelopes, thank you notes and business cards, but we’ve also helped clients branch from print to digital and vice versa with web site design, multimedia presentations and email blasts. If you use us for your print and design needs already, we encourage you to browse our site to see what other services we offer. You may be surprised what we can do for you in our 24,000 sq. ft. facility!